I'm new to the Audio Pro Series and the last time I tried wireless speakers, it was an unmitigated disaster. As such, our editor thought I was the perfect candidate to review these speakers and find out if we've made strides in wireless technology. Audio Pro is a Swedish company that has been in the audio business since 1978. The LV3 floorstanding speakers featured in this review retail for $2,000 per pair and are part of Audio Pro's Living LV line, which includes the single speaker LV1, LV2 bookshelf speaker (which I also reviewed) and LVSUB subwoofer. All of the speakers in the LV line are wireless and, aesthetically speaking, they're simply gorgeous. They all come wrapped in your choice of white or black leather - cool eh? Currently, they're only available through high-end, specialty audio shops in major U.S. markets. 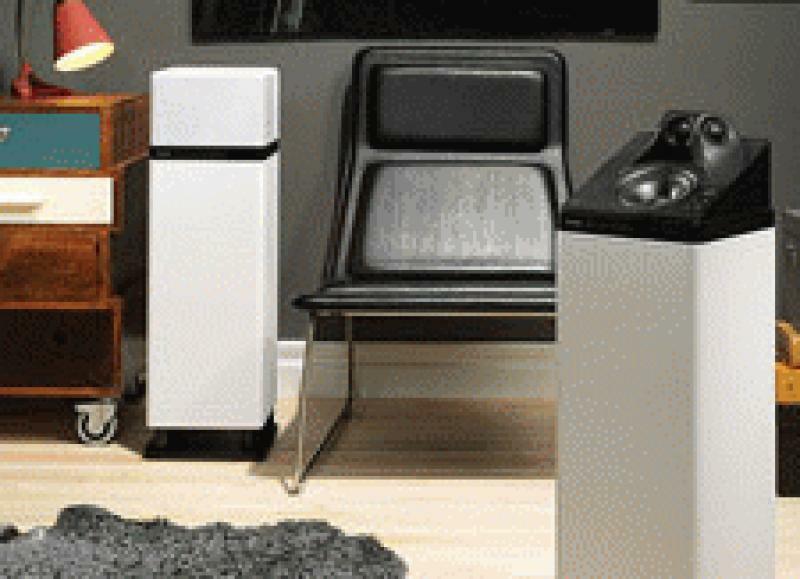 • Read more floorstanding speaker reviews by HomeTheaterReview.com's staff. • Look for sources to pair with the LV3s in our Source Component Review section. • Explore AV receiver options in our AV Receiver Review section. The LV3 measures 29.5 inches tall by just less than nine inches in width and depth. I found the size to be perfect, not only for blending seamlessly and unobtrusively into a room, but also for keeping a wife happy. Each LV3 features three, one-inch silk dome tweeters; one, four and a half inch midrange driver and one, six and a half inch down-firing woofer. Amplification comes courtesy of one 100-Watt amp and two 35-Watt Class D amps. The LV3 is a three-way bass reflex design with a unique driver configuration, which provides greater placement flexibility. With the grill (which mounts on the top of the speaker) removed, it looks a bit like something out of Star Wars, and I mean that in the most complimentary way. These speakers are aesthetically stunning, grills on or off. This aspect of their design also increases their versatility; you can go grills on to make them blend into your room, or remove them to make them stand out and create a conversation piece. The packaging on the LV3s was top-notch and definitely in line with what you'd expect at this price point. As is typical with higher end audio, they came packaged in a box within a box. Inside the box, everything was laid out intuitively and with adequate spacing between the accessories. Audio Pro even goes so far as to include a pair of white gloves, so as not to mar the fine leather wrap. And trust me when I tell you, once you've handled a pair of these speakers, you don't want to take any risks in marking them up. By the time you finish reading this review, you're going to be sick of me talking about how gorgeous these speakers are - mea culpa. The other thing I'll rave about is the simplicity of setup; you simply plug each speaker into a power outlet, pop the included USB dongle into your computer (Mac or PC) and then enjoy brilliant CD quality sound. Trust me when I tell you - it's that simple. I think my dad could handle this one and he's still trying to figure out his cable remote. One thing worth noting when hooking them up is that, due to their design, they're not finicky about placement. While you can certainly improve the sound of any speaker by moving it around in a room, I found the LV3s to be extremely forgiving in terms of placement. Further adding to their versatility, the LV3s can play music from other sources such as iPods, cell phones, network music players, etc. You simply plug your source into the USB dongle via its 3.5mm input and you're in business. The one caveat is that you'll need to supply power to the TX100 dongle via a USB power adapter, which is sold separately. In my setup, I used the two LV3 speakers in a standard two-channel stereo setup, but each speaker has a switch on the back that allows you to use it in a mono capacity, in case you want to have a single LV3 in one room and another in a separate room. Another cool feature is a bass EQ, which allows you to adjust the bass from +10 to -10 dB to compensate for placement in the room. I had each speaker positioned about 10 inches out from the wall and neither were near a corner, so I left the bass levels alone, but every room is different, so it's nice to have the option. Another cool thing to note about the functionality of the LV3 is the option to add an infinite number of speakers in your home. Each speaker has three different "House Codes," or channels, which allows you to have three different zones with three different volume levels. You can also have the same volume level throughout the house using master volume and all of this can be controlled by the included remote. 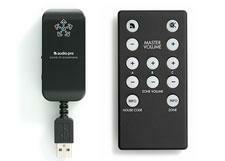 Speaking of the remote, I found it to be intuitively designed and very simple to use. Using the House Codes, you can also play different music from different sources in up to three zones, though you'll need two additional transmitters in order to do this. This is a great way to handle multi-room audio without having to hire installers and run cable all over your house. Typically when doing a review I have to think about which Blu-ray is good for demonstration, which of my albums are well recorded, which ones I haven't used recently, etc. In this case it was simple; whatever was currently residing on my MacBook Pro was going to be good fodder for the LV3s. As it happens, my library consists of MP3s, Apple Lossless audio files and some high-resolution 96/24 tracks downloaded from www.HDtracks.com. After a good ten hours plus of break-in, it was time to remove the grills and get to some critical listening. Read about the performance of the Audio Pro LV3 loudspeakers on Page 2. NSMT Loudspeakers Model 50/Jamaica Speaker Reviewed Whether you're rocking high-powered solid state amps or flea-watt SETs, the NSMT Loudspeakers Model 50/Jamaica absolutely excels, says Terry London.